I'm just back in and am thawing and drying out after the Gaza march and rally in Edinburgh. Due to a meeting over-running this morning, I didn't catch up with the march until it came back on to Princes Street after the trip to the US Consulate. I was really pleased to see so many people had turned out. The Police estimate was around 5000 but it looked and felt like more. Bob reckoned that there would have been at least 6000 when the march formed on East Market Street. I found Bob, Anna (who had been very good for the almost two hours she was out in the cold) and Stephen pretty quickly. Bob and Anna soon went off to get something to eat but Stephen and I continued on to the rally at the Ross Bandstand. 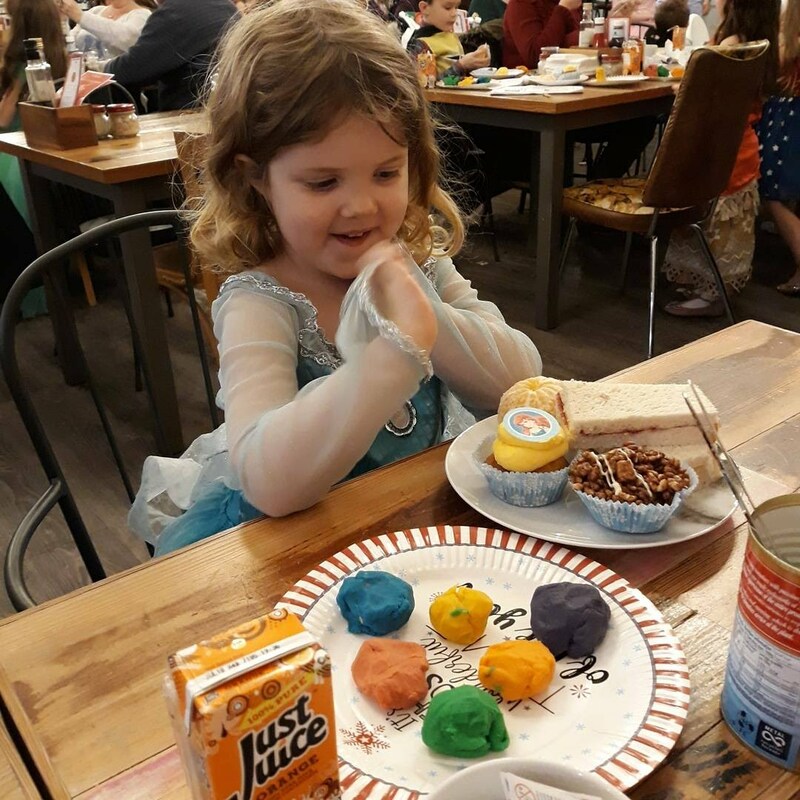 Bob and Anna actually met a Palestinian family in Pizza Hut who, when they saw the Palestinian flag Anna was carrying, thanked her for caring about their country. She now feels that she did something worthwhile today. Bob and Stephen both commented on the excessive number of police taking photographs of participants. The march was very well behaved and peaceful so I'm not quite sure why this was so necessary, particularly in an area of town that already has huge coverage with CCTV cameras. There was only one MP there at the rally - John Barrett, Liberal Democrat member for Edinburgh West. He was the last to speak and we stuck it out to the end, despite the cool, dry Winter's afternoon turning nasty. By the time we left, it was pouring with rain and there was a really driving wind. Stephen had to get out the strawberry lip balm at one point for himself. The rally started though with a child of around 7 or 8 going up on stage and starting a chant "George Bush where are you? We want to throw a shoe at you" which apparently they had made up on the way round. She made the whole crowd laugh. We heard from a huge variety of speakers from trade unions, Jews for a Just Peace, the Scottish Islamic Federation, a doctor talking on the phone direct from Gaza describing the humanitarian crisis, MSPs Sandra White and Pauline MacNeill and John Barrett. One telling point made by the Scottish Islamic Federation speaker is that they would unequivocally condemn any bombings by terrorists in any western country as they don't advocate violence by anybody - yet the US fails to condemn these appalling raids on Gaza. 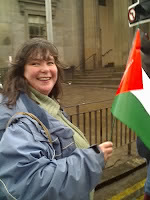 Pauline MacNeill spoke about how she had gone to observe the elections which saw Hamas come to power in 2006. She said that Hamas wouldn't have been her choice, nor many other people's, but they were the legitimate choice of the Palestinian people and the influential countries in the world needed to engage with them. Pauline was the first person to really help me to understand the plight of the Palestinian people over 20 years ago when she was President of NUS Scotland and I was just a naive and innocent first year student. John spoke about how he had asked Gordon Brown about the number of civiians who had been killed in Iraq since the war there had begun and how he had been given the chilling answer "it's not for us to count these things." He reiterated how Nick Clegg had been the only UK leader to speak out against the Israeli action and called for a million people to take to the streets when Barack Obama visits here in February to show our opposition to these awful attacks by Israel in the same way as we did for the Iraq war. He said that everybody who felt strongly about this should go and visit their MP and reminded us that Gordon Brown's constituency was only a little bit to the north and Alistair Darling's was 5 minutes away from where we were. The more I have looked into this the more passionately I feel for the plight of the Palestinian people. The Israelis have spent a fortune raining down bombs on these poor people. They force them to live in appalling conditions, often without electricity or running water. What if they spent the same amount of money giving them schools, hospitals, clean, safe water and reliable electricity? That humanitarian gesture would do so much for the cause of peace. Let's hope that once Obama takes office he uses his authority to take action to end this, so that we never again have the disgraceful display we saw the other night when the US abstained on a relatively tame resolution calling for a ceasefire. I was also at the march in Edinburgh with my two young children and sister. Despite the chilling winds we all stood united. I think that Britain and USA governments are shameless to allow these barbaric atrocities to be carried out but I question the bloody Arab leaders for not taking action to help their muslim brothers & sisters, they should know better but then they have their inferiority complex and lust after casinos and acceptance by the West. They are the REAL dogs, and I say thsi as a muslim, I am so ashamed of the bloody Arab and Egyptian sell outs!! The Palestinian people have been let down by pretty much everybody over the years. Let's hope that a solution is found for them in the next few years so that they can have their own homeland and live in peace and prosperity.